Dems, You Want Guns Gone? Then YOU, Come and Take Them! 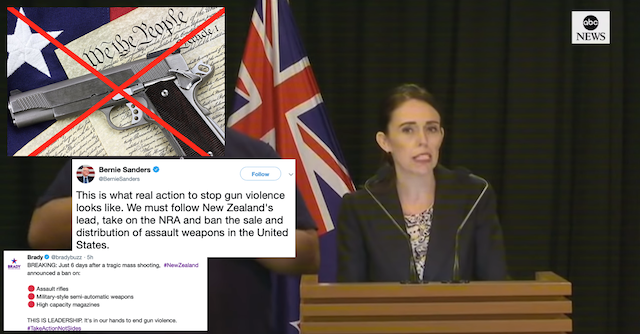 In the wake of the New Zealand terror attack where they have acted out of emotion vs logic to ban all semiautomatic weapons, especially those deemed “military style”. What’s a “military style assault weapon”? Leftists cannot answer this question because it doesn’t exist. They made it up to scare people, and frankly all weapons are military weapons. Democrats in the US like Sen Sanders are of course applauding New Zealand, calling for the same actions in the US. Month after month, for years, decades really, democrats have been ranting and raving how all the guns in America needs to be taken away from civilians. Dems, you want the guns gone? Then Y O U come and take them from law-abiding gun owners – YOU DO IT! Do not pass an unconstitutional law where others are tasked with doing your dirty work of door to door confiscation. Any democrat, leftist, progressive or whatever in the hell you people are calling yourselves this week, who is anti-gun and wants the guns gone should be the ones doing the taking! Yes, I’m saying everyone from politicians like Sen Sanders, Feinstein, Moms Demand’s Shannon Watts to the local activist, be the ones to go door-to-door taking weapons from law-abiding Americans. NO this is not absurd, they’re the ones who want them, they should be the ones to take them vs law enforcement or military being tasked with the job! If by some act of God the left gains a super majority again and actually enacts a gun confiscation they will have a fight on their hands the likes of which has never been seen in this country, not even during the Civil War where 500K died. And no lefties that’s not a threat, nor coded language, it’s a fact. There are close to 400,000,000 guns in the US in the hands of 100-200M LAW ABIDING gun owners along with billions, if not trillions, of rounds of ammunition. Please leftists do tell how you plan on disarming 100-200M well armed Americans?? The Constitution upholds/ reaffirms God-given/ Natural Rights no one can take away. The very existence of the Second Amendment is in direct response to the knee-jerk reactions and stupid, uneducated people calling to disarm civilians. One more thing, the people who want guns gone are threatening those with them to give them up or they’ll come after us with their guns to take our guns!! Do you people ever listen to yourselves? You violent hypocrites. You gun grabbers are beyond mental, extremely dangerous and tyrannical just as the Founders feared thus the existence of 2A! You want our guns? Come and take them.